While it’s at the height of summer in Japan, sadly summer seems over here in UK. (Sniff.) End of summer always makes me melancholic, bringing back summery memories from my childhood, particularly ones with my big brother. 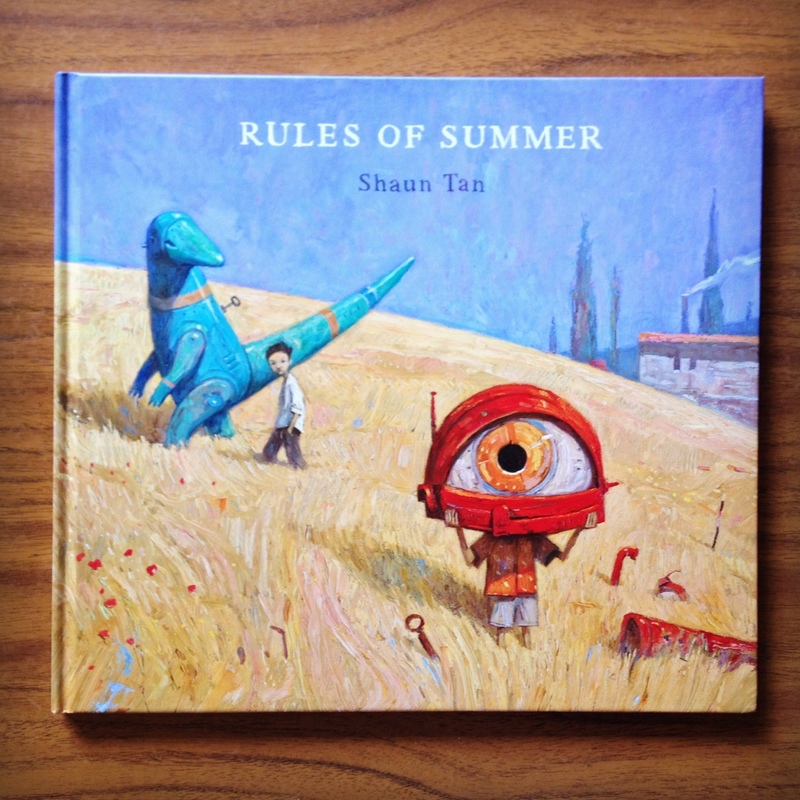 And I have a picture book that perfectly reflects the bitter sweet feeling – Rules of Summer by Shaun Tan (Hodder Children’s Book 2013). Rules of Summer follows events of a summer in the lives of two brothers. It sounds pretty conventional, doesn’t it? However, the book is nothing like any other. The structure of the book is simple. Each spread accompanied by one sentence – a ‘rule’, such as “Never leave a red sock on the clothesline” and “Never eat the last olive at a party”. Those rules don’t make much sense on their own, but, together with Shaun Tan’s surreal dreamlike images, weirdly they do (well…more or less). The world Shaun Tan created here is mesmerising. Each spread is like a summer snapshot from a science fiction. The industrial, dystopian world is inhabited by gigantic animals and rusty robots. It could have been too threatening for young readers but here Shaun Tan masterfully got the balance between light and dark, scary and sweet just right. Award-winning Australian illustrator Shaun Tan‘s artwork here is work of genius. These oil paintings are full of texture, rich in colour and atmospheric. They are to me it’s very ‘Australian’; I can almost feel the dusty, dry heat down under by just looking at the pages. If you want to know how he created the amazing artwork, read this a brilliant interview on Picturebook Makers blog. Those seemingly discontinuous snapshot-like images are connected by the brothers There is no clear narrative but it centres on the journey of the relationship between these two boys. While the world they live in is surreal, these characters couldn’t be more real and convincing. In this almost textless book, the complex brotherly power relationship is beautifully depicted with the character’s facial expressions and body languages. Things become darker and more sinister as the boys push their games further and further by breaking rules, and they learn a lesson when they take it too far. If I describe this book in one word, it would be ‘epic’. I’m always drawn to stories about brotherly love and rivalry (somehow not so much to sisterly relationship) probably because I had a complicated relationship with my brother when I was younger. Rules of Summer is one of the biggest inspirations for my WIP debut picture book as an author/illustrator, which is (surprise, surprise) about two brothers. With this book, I’m hoping to achieve what Shaun Tan has; to illustrate brotherly relationship through images with humour and sensibility. Here is a spread from the book.